And I’ll tot if I want to. That’s right friends, today is my thirty-second birthday! Can I get an Arsenio Hall whoop, whoop, whoop? A part of me is still a little baffled that I am basically in my mid-thirties because some days I still have the emotional maturity of a nineteen year-old on Red Bull. Yet, here I am, ready to Katy Perry roarrrrrrrrrrr this thirty-second birthday. Plans for the day? Nothing set yet. Possibly a stroll through Uncle Nordies, maybe a facial, dinner out with Mr. B this evening, and of course the making of my childhood favorite, chocolate cake with marshmallow frosting! Because you can’t have a birthday without some cake, yo. 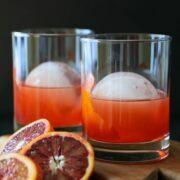 I have been waiting patiently to post this recipe. Actually, my main lemon slice, Liz, gave me the link to this idea a few months ago about the whole tater tot hash brown making in the waffle iron. I about passed out from excitement. So, I thought my birthday would be the perfect time to celebrate the waffle-tot! The whole waffle-tot process is easy peasy. Let the tots thaw until only partially frozen, plop them onto a waffle iron, press down, wait as tots begin to turn golden. Remove from waffle iron, and place on plate. 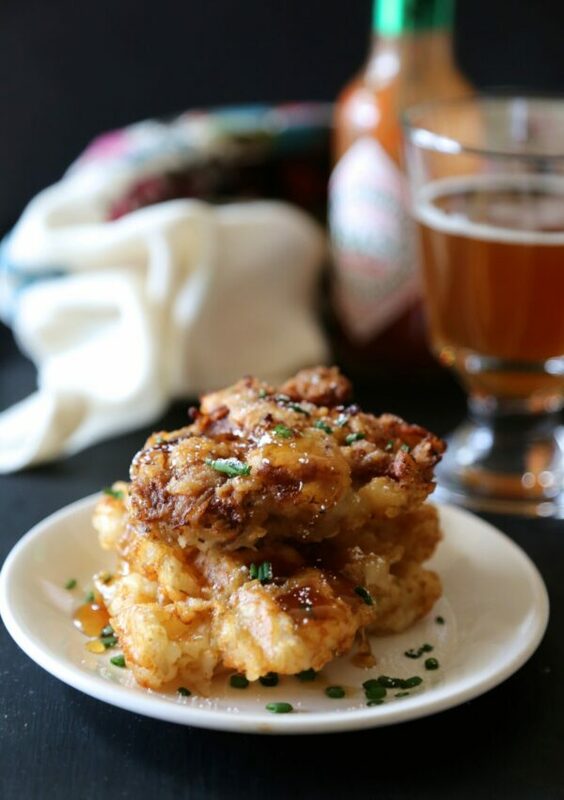 Top with my famous 15-minute fried chicken and drizzle the top with honey….have tot mercy! Peace my nizzles. (drops mic). In a large bowl, combine buttermilk, egg, Tabasco, and salt and pepper. Place chicken thighs into the bowl and let it sit for a minute or two. In another bowl, combine flour, cayenee, and salt and pepper. Add the vegetable oil to a 10-inch cast iron skillet. Heat to medium-high. Next, take a piece of the chicken and dredge it into the flour shaking off any extras. 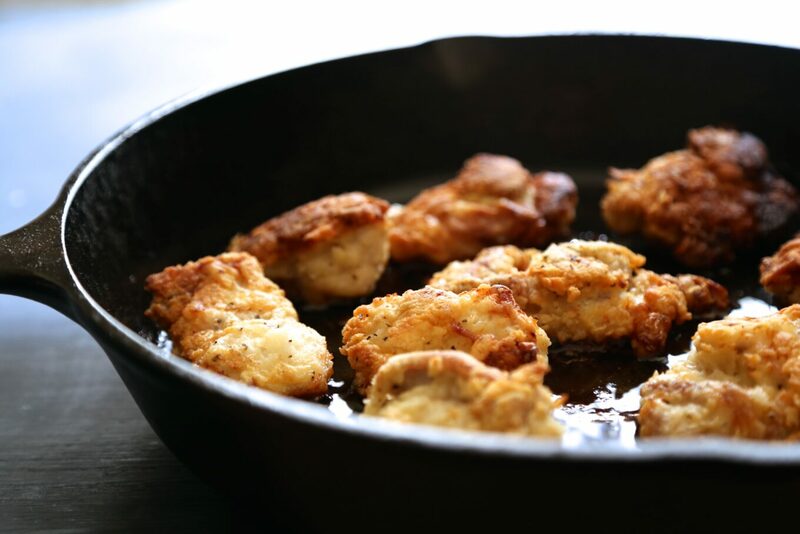 Place chicken in skillet. Repeat with remaining pieces. Cook chicken for about 5 minutes on the first side. Flip and place skillet into the oven for about 10 to 12 minutes. Once cooked, remove skillet from oven and let cook slightly. To serve, place two waffle-tot squares on a plate. Top with a piece of chicken or slice in half. Garnish with honey, parsley, and confectioners sugar. Open bag of frozen tater tots. Lay them on a baking sheet and let them thaw for about thirty minutes or until only partially frozen. Next, heat a waffle iron. Place about 15 to 20 tots evenly onto the waffle iron. Slowly press down on the tots until flattened. Cook tots for about two to three minutes. Once cooked, remove from waffle iron and sprinkle with salt. Repeat process until all tots have been used. HAPPY BIRTHDAY LOVELY!! Tots + fried chicken = best birthday food EVERRRR! Hope you have a brilliant day and receive lots of prezzies … what else are birthdays meant for? PS: We’re celebrating our wedding anniversary today! Snap! happy birthday! i turn 32 in april and i’m still not quite sure how i feel about it. i do know that i wholeheartedly condone waffle tots as a birthday treat–they look incredible! Happy birthday lady! I must say, you know how to celebrate! Daaaang these waffle tots look amazing!! I’m practically drooling over the photos. Happy birthday, and enjoy your day 🙂 You clearly know how to celebrate with good eats! Happy birthday! My 30th birthday is right around the corner and I am liking how you celebrate. I had never had fried chicken and waffles until I move to Memphis and now that I no longer live there I miss it! Happy Birthday!! I like how you celebrate! HAPPY BIRTHDAY! This looks amazing!!! Excellent way to eat tots!! Happy Birthday! Happy Birthday! Yum! This might be the most amazing way to celebrate a birthday! Want all of this. Pinned! Happy Birthday! 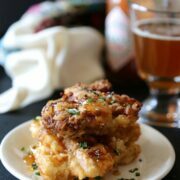 And what a decadent (and delicious) dish to celebrate with – nothing beats good fried food! Happy Birthday! 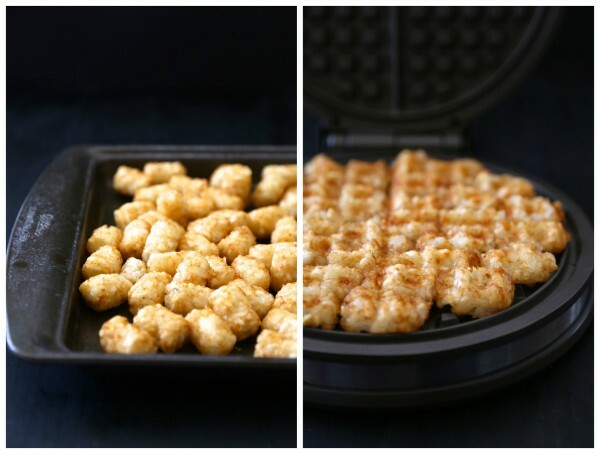 Love this hilarious post and can’t wait to try tater tots in the waffle iron. SO genius! Have a wonderful Birthday! Happppy Birthday!! What better way to celebrate than with fried chicken and (tot) waffles. 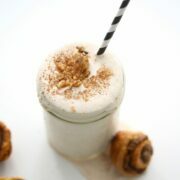 Add a strong cocktail to that and dessert and you’re good to go! Happy Birthday! I’m definitely keeping this recipe so i can also have it for my birthday!!!! I hope you had eleventy billion of these plus eleventy billion slices of chocolate cake for your birthday. Happy happy, friend! Chicken thighs? You know your meat! WHOOOOP!!!! (there it is) happy belated girrrl!!! This is everything that’s right and good with the world served on a plate. Best. Birthday. Dinner. Ever! Yeah, mid-thirties. I’m about to join you in June. Not happy about it, but I’m betting this recipe can fix that. Have a great day. Pinned! Happy birthday sweet lady! 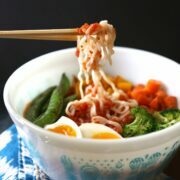 This recipe has me drooling. 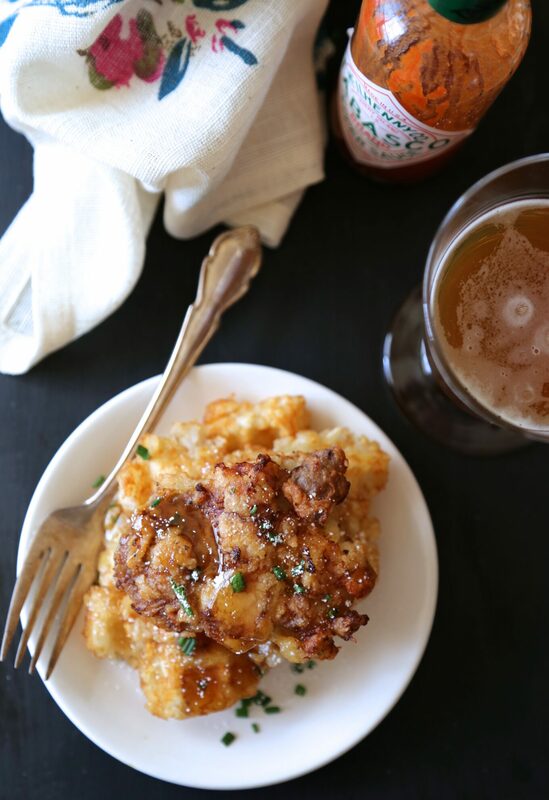 I’m so in love with the honey drizzle over the fried chicken….seriously love right here. Happy belated birthday! This looks incredible! Waffle tots? Genius! Happy belated Birthday Lauren! These look like the perfect celebration meal! Waffle tots!! How creative! 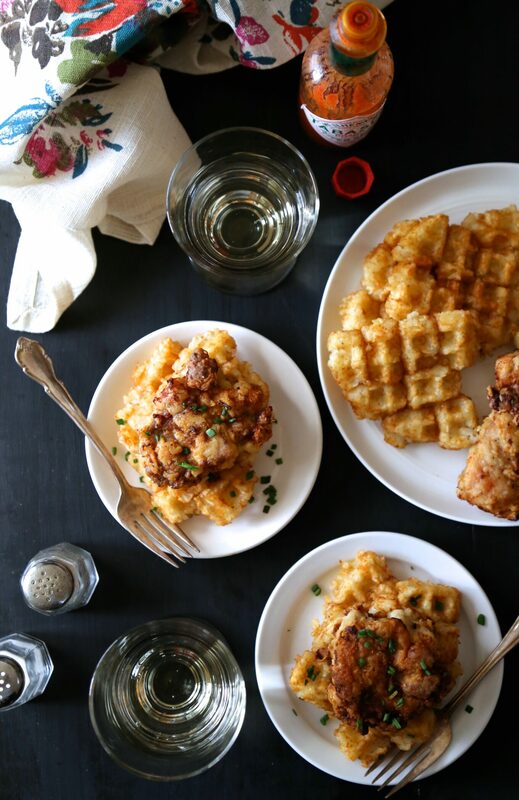 This is such a brilliant twist on the classic chicken and waffles dish. Hi! 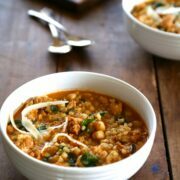 This recipe looks delicious, just curious what plugin you use to create your recipes? I love the way it’s set up! I’m now feeling a little bad that I didn’t have a tot waffle on my birthday! Can I get a redo? And a huge stack of these? That looks awesome! They have fried chicken and waffle ice cream in LA too in case you are looking for more!